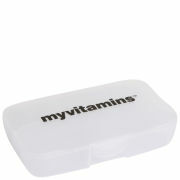 The Myvitamins PowerTower is the latest in convenient supplement storage and transport. Compact, light weight and easy to use the PowerTower provides three individual portion containers, ideal for your daily servings of tablets, powders and foods. Each individual 180ml container can be attached and securely screwed in place, providing an airtight container. A lid is included to securely seal the top container. Made from high quality, food grade plastic, the PowerTower is durable and can double up as handy everyday storage for the home or your desk at work. And should three containers not be enough, simply buy more and add them as you go.